COMP Cams Roller Rocker Arms - Ultra-Gold ARC Aluminum - Pann Auto Performance - San Diego largest aftermarket automotive performance parts - What do you drive? The original Ultra-Gold Aluminum Rockers changed the way racing and high performance street engine builders approached valve train design. Now, COMP Cams is revolutionizing valve train performance again with the next generation of Ultra-Gold ARC Series Aluminum Rocker Arms, featuring an Arced, Recessed, Contoured design. Using cutting-edge design techniques and manufacturing processes, Ultra-Gold ARC Rockers increase engine power, enhance valve train stability and improve oiling. Ultra-Gold ARC Rockers feature a new extrusion based on improvements developed through FEA analysis, resulting in an even stronger, stiffer body without compromising mass. A new arced channel and contoured top, similar to a bridge design, give the rockers the best strength-to-weight ratio possible. The body has additional CNC contouring to improve clearances for valve covers and springs. 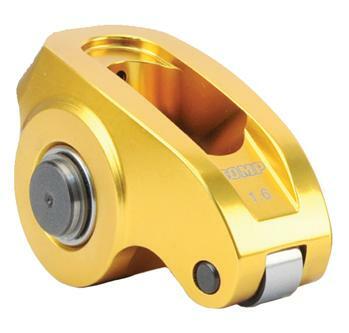 Manufactured entirely in the U.S.A., all Ultra-Gold ARC Series Aluminum Rocker Arms feature a spring oiler channel through the body for improved lubrication. Trunnion retaining clips have been replaced with an ultra durable spiral lock type clip, similar to what holds a piston pin in place. Stress relieving radii have also been added to areas of the body, trunnion and pushrod seat insert. Even the included locking nuts (not used in LS applications) have been revised to increase surface area to better maintain lash and eliminate wear. Precision-sorted trunnion bearings withstand valve spring pressure up to 700 lbs.